A frozen hinterland with a wild frontier spirit, Hokkaidō ( 北海道 ) is defined by everything that Japan’s southern islands are not. Aside from a few major cities such as Sapporo ( 札幌 ), the untamed north country is a hauntingly beautiful wilderness, on par with the Canadian Rockies or New Zealand’s South Island. For the thrill-seeking traveller in search of sweeping vistas, amazing wildlife, wide open roads and overwhelming emptiness, Hokkaidō is a refreshing contrast to the crushing density of Honshū. In fact, the image of cruising across these hinterlands is associated with unfettered freedom in the minds of the Japanese. From November to March, a Siberian cold descends on the island, providing some of the best skiing in Japan and the eastern hemisphere. When Hokkaidō thaws, and the bears awaken from their hibernation, the island lures hikers in search of rugged backcountry terrain and remote onsen. The Ainu, Hokkaidō’s indigenous people, have shaped this island’s history. After the glaciers receded, the Ainu settled here and called the land Ainu Moshiri – Ainu meaning ‘human’ and Moshiri meaning ‘world’. Until the Edo period (1600–1868), the Ainu and the Japanese, remarkably, had relatively little contact with each other. However, this changed when the Matsumae clan established a major foothold for themselves in southwestern Hokkaidō, and successfully bargained with the Ainu. They succeeded in creating a trade monopoly, which was lucrative for the clan, but would ultimately prove disastrous to the Ainu people. By the end of the Edo period, trade and colonisation had begun in earnest, and by the time the Meiji Restoration began in 1868, the Ainu culture was under attack. Many Ainu customs were banned, women were forbidden to get tattoos, men were prohibited from wearing earrings and the Kaitakushi (Colonial Office) was created to encourage mainland Japanese people to migrate northward. When the Meiji period ended, the Ainu had become de facto second-class citizens, and by the start of the 20th century, the mainland Japanese population on the island topped one million. With world attention focused on Hokkaidō when Sapporo hosted the 1972 Winter Olympics, Japan felt the need to ease restrictions on the Ainu. Sadly, however, it would take another 26 years before significant protections were written into law. Though marginalised for much of the past century, the Ainu have recently won recognition as an important part of Japanese cultural heritage, and are re-establishing themselves. Today, the Ainu are proudly continuing their traditions while still fighting for further recognition of their unique culture. Hokkaidō boasts some of Japan’s oldest and most beautiful national parks. Daisetsuzan National Park, centrally located near Asahikawa city, is a must-see. This stunning expanse of mountain ranges, volcanoes, onsen (hot springs), lakes and hiking tracks is Japan’s largest, covering 2309 sq km. Akan National Park, near Kushiro, has onsen, volcanoes and hiking. In spring, thousands of cranes flock to Kushiro Shitsugen National Park, one of Japan’s largest marshlands; deer, foxes, shima-risu (none other than the humble chipmunk!) and a host of birds are abundant. The northern islands of Rebun and Rishiri offer superb hiking and views of seaside cliffs, volcanic mountains and (in season) hillsides of flowers. Shiretoko National Park, in the northeast, is as remote as it gets: two-thirds of it doesn’t have roads. Ponds as glassy as reflecting pools, rivers with brown bears munching salmon, waterfalls more delicate than rice-paper paintings – the scenery is stunning, but tourists are told quite plainly that if they venture into restricted areas they will be fined, eaten by Higuma bears…or both. 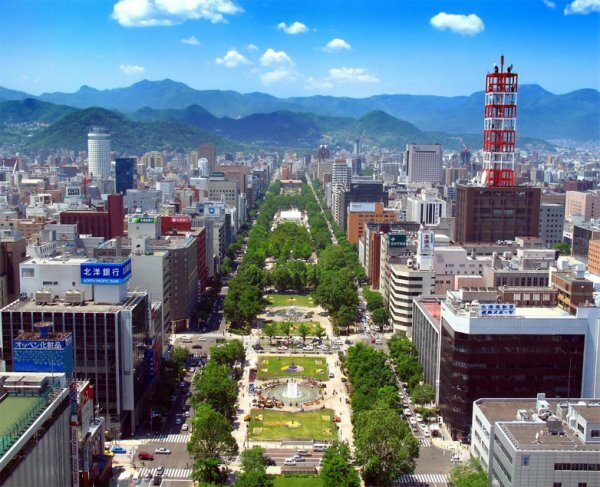 Sapporo is the main hub of all Hokkaidō traffic, though Hakodate and other smaller cities also offer direct flights to many of Japan’s larger cities. For those without Japan Rail (JR) Passes, domestic ferries from Honshū are a low-cost alternative to train travel. Hokkaidō also serves as a jumping-off point for the maritime route to Russia. If you are coming from Tokyo, consider taking either the Hokutosei sleeper train or the more luxurious Cassiopeia to save time. Note that the shinkansen (bullet train) does not offer a service direct to Hokkaidō, at least not until 2015 at the earliest. Take it as far north as Shin-Aomori, and then transfer to the tokkyū (limited express). Sapporo and Hakodate both have flights to all other major Hokkaidō cities. For fans of greener ways to get around, Hokkaidō is a good place to tour by bike. Charida (bicycle riders) are a common sight on major roads. Rider houses or cycling terminals (Click here ) are also cheap, common and great places to meet other cyclists as well as bikers. Within cities, buses are convenient and usually cheap. Ask about a norihō dai (all-day) pass if you’re going to use them a lot – there’s often a substantial discount. Private-vehicle rental is recommended as the island’s beauty is in its landscapes. Car-rental rates vary, but if you walk in off the street expect to pay between ¥7000 and ¥10,000 per day, plus the cost of fuel (which can certainly add up!). You will need an International Driving Permit, which you must get from your home country prior to arrival in Japan. Trains run frequently on the trunk lines, but reaching remote locations involves infrequent connections. In addition to the country-wide JR Rail Pass, there is also a Hokkaidō Rail Pass: a three-/flexible four-/five-day pass costs ¥15,000/19,500/19,500.